In 2006, the UK introduced a law making it possible for UK private pension benefits to be transferred to a Qualifying Recognised Overseas Pension Scheme (QROPS), provided that the overseas scheme meets certain qualifying conditions. Broadly, the qualifying rules are designed to ensure that the overseas pension scheme follows UK pension legislation. Transferring UK pension benefits is a highly specialised area of financial planning and so should not be entered into lightly. Obtaining advice from a suitably qualified adviser is essential. Notwithstanding this, transferring benefits to a QROPS can provide certain advantages to expatriates. In all cases, a full analysis of the UK benefits should be carried out and compared to the potential benefits offered by the QROPS. What qualifying conditions must a QROPS meet? What is the ‘10 year’ reporting rule? For the 10 year period from the date that the UK pension benefits are transferred to the QROPS, the trustees of the overseas pension scheme have to report once a year to the UK’s HMRC to confirm continuing qualification with the rules. They also have to report payments made to the member and to his/her dependants from the scheme. After the 10 year period, this reporting requirement falls away. What is the ‘5 year’ rule? It is not necessary to have already left the UK for five years to take advantage of a transfer under the QROPS provisions. However, if the member receives benefits from the QROPS while UK resident or during the first five complete tax years of non-UK residency (proposed to be increased to ten complete tax years for pension transfers taking place from 6th April 2017), which exceed those that are permitted under UK pension rules, a liability for a UK ‘member payment charge’ arises. Currently, this is 55% of the excess level of benefit payment received. Is it a good idea to buy an annuity? If you are highly risk-averse, you may feel more comfortable with the idea of annuity purchase, knowing that you will be provided with a certain level of income for the rest of your life. In effect, an annuity means you give your capital (i.e. the amount that you have built up in your ‘pension pot’), less any Pension Commencement Lump Sum that you decide to take, to an annuity provider. In return, the provider will guarantee you a lifetime income (i.e. your pension), no matter how long you live. There are advantages and disadvantages to buying an annuity. The advantage is you know how much income you are going to receive and you know that you will get this for life. Annuity rates vary depending on a number of circumstances, but in particular the level of interest rates. The current low levels of interest rates have meant many people have ended up with a lower amount of pension income than they might have hoped for. Unfortunately, when you buy an annuity your capital is gone forever. This is the trade-off for getting a lifetime income. Furthermore, should you wish to build-in inflation protection and a pension for your surviving spouse, since your ‘pension pot’ has to stretch much further, this will reduce the amount of your own pension that you receive. In addition, unless you have purchased certain guarantees at the outset (and even if you have the guarantee period is typically only 5 or 10 years) then all of the remaining fund will pass to the insurance company on your death and not to your chosen beneficiaries. What is the alternative to a lifetime annuity? When you transfer your pension funds to a QROPS, there is an alternative to a lifetime annuity. At retirement, after deciding whether or not to take a Pension Commencement Lump Sum, the member is given the option to take withdrawals from the invested QROPS fund, according to a figure provided by the UK Government Actuary Department (GAD), based on UK gilt rates and the member’s age. The maximum amount that can be drawn as income from the QROPS is reviewed every three years (annually after age 75) and an appropriate adjustment to the level of income may be necessary, where the level of income being paid is above the new maximum. However, the new flexibility rules that apply to UK pensions have now being introduced in some jurisdictions, for example, Malta. In such cases, the member will have the same benefit choices as would be available to a UK Self-Invested Pension Plan (SIPP). What happens when the pensioner dies? Under UK pension rules, in the event of the member’s death after age 75, any lump sum death benefit paid to a member’s beneficiaries would suffer a tax charge at the beneficiary’s marginal rate of UK income tax. Under QROPS rules, however, once the member has been non-resident in the UK for at least five complete tax years, there is no UK tax payable in respect of any lump sum death benefits paid to nominated beneficiaries. However, it is proposed that this period will be increased to ten complete tax years from 6th April 2017. Furthermore, it will usually be possible to set up the QROPS so the surviving spouse can continue to draw an income from the fund, following the member’s death. Any remaining fund, after the spouse’s death, would then be paid as a lump sum to the member’s nominated beneficiaries, again with no UK tax charge (subject to the minimum UK non-residency requirements). What happens if the QROPS member returns to the UK? The QROPS trustees are obliged to report this to HMRC and the former UK pension benefits transferred to the QROPS will become subject to UK pension regulations again. If the QROPS trustee fails to report this “event”, the pension scheme will lose its QROPS approved status and if the member does not inform the trustee, he/she will be breaking the law. It should also be noted that if the member flexibly accesses benefits, resulting in the relevant pension (the amount received less the Pension Commencement Lump Sum) being £100,000 or greater, and returns to the UK within 5 complete tax years of leaving, he/she will be subject to UK income tax on the full relevant pension at his/her marginal rate of income tax. This is known as an Anti-Avoidance Rule and the 5 year period is based on the UK’s residency rules. However, it is not mandatory for the earlier transfer payment, in respect of the former UK pension benefits, to be returned to a UK pension provider. Therefore, the pension assets within the QROPS will continue to be subject to the pension rules of the jurisdiction where it is set up. As such, it will be treated by the UK as a ‘foreign pension’. Nevertheless, as the member will now have become UK resident again, based on the current UK rules, the income that is drawn from the QROPS pension fund is taxed as earned income, in exactly the same way as all other UK pensions. In order to avoid double taxation, therefore, the existence of a Double Taxation Treaty (DTT) between the UK and the jurisdiction in which the QROPS is located is important to ensure that the member is not taxed twice on the same income. Although the reality is that if the income payments are paid gross by the QROPS, i.e. without the deduction of local withholding taxes, then this should not be an issue. Current UK tax rules state that only 90% of ‘foreign pensions’ are taxable in the UK, which is beneficial compared with pensions from UK sources, since 100% of UK pensions are liable to income tax. However, the UK Finance Bill 2017 proposes to bring foreign pensions in line with UK pensions and if passed into legislation, the 10% tax relief will be abolished. As concerns any lump sum death benefit payable from a QROPS, if the member is over age 75, and he or she dies as a UK resident, the lump sum death benefit payable following death would be subject to a tax charge at the beneficiary’s marginal rate. However, the UK tax charge on the death benefit would only apply to any part of the fund remaining from the former UK pension benefits that had been transferred to the QROPS. Any benefits already received (PCLS and/or income withdrawals), would be considered as having been taken from the previously transferred UK pension funds, thus reducing the taxable element. A good investment for one part of the economic cycle may not be so good at other times during the cycle. Therefore, it is vital you have sufficient flexibility to choose from investments that are going to be right for you and most importantly, in the relevant currency. For example, as you approach retirement, you may wish to move investments to a lower risk environment. In retirement, you will want to concentrate on obtaining income from your investment (effectively, your pension). More information is included in our investment section. How is income drawn down taxed in France? French residents are liable to French income tax on all worldwide income. Hence, in order to avoid double taxation, the existence of a DTT between France and the jurisdiction from where income is generated is very important. Since QROPS are often set up in tax-favourable jurisdictions, however, it may be that there is no existing DTT with France. In such circumstances, it is important to ensure payments from the QROPS are paid gross. For this reason, any income drawn from the QROPS, or Pension Commencement Lump Sum taken, must be declared on the French income tax return. This is no different from the cases where payments were received directly from the former UK pension scheme from which the benefits were moved to the QROPS. No, and if a transfer is made from a registered UK pension scheme to an overseas scheme that does not have QROPS status, the member will be liable for an unauthorised payment charge totalling 55% of the transfer value. A non-exhaustive list of QROPS can be found at www.hmrc.gov.uk/pensionschemes/QROPS.pdf – at the time of writing, there are no French schemes on this list. Above all, seeking professional advice is crucial, as well as choosing the right jurisdiction to hold the QROPS and a suitably approved pension scheme provider. QROPS may not be suitable for everyone and much will depend upon the nature of the UK pension benefits being considered for transfer, as well as the person’s attitude to investment risk. The person’s age also plays an important part. For example, a UK SIPP before age 55 could provide the same benefits as a QROPS, but for a lower cost. However, once the member starts to draw benefits (even if this is only the PCLS) the QROPS is very often a better option than a SIPP. Hence, an important part of the process of deciding whether or not a transfer of UK pension benefits to a QROPS is in an individual’s best interest is to carry out a full review of the person’s personal and financial situation. In cases where a defined benefit scheme pension fund involves a final salary pension scheme and other types of guaranteed benefits, a full transfer analysis should be carried out. This should be in accordance with guidelines set out by the UK Financial Conduct Authority. Notwithstanding this, many UK final salary schemes now have large deficits. Even if pension liabilities of such schemes are transferred to the UK Pension Protection Fund, members may still not receive their full expected entitlement. Arising out of this, an increasing number of expatriates are choosing to transfer their pension benefits to a QROPS to avoid this risk. Everyone’s personal situation is different and attitude to investment risk varies from one person to another. If you have already left the UK permanently, or intend to do so for at least five years (possibly ten years from 6th April 2017), then it is worthwhile having a full expert appraisal of your situation to determine whether or not QROPS is suitable for you. With the exception of occupational pension schemes, this does not depend on your pension benefits not having come into payment. In fact, if you are already taking ‘income drawdown’ from a SIPP, this does not exclude you from exploring the QROPS option. It is also worth noting that there have been many regulatory changes to UK pensions over the years. Unfortunately, these changes can often have an adverse effect on your retirement planning and consequently your long-term financial welfare. Even now, we can expect more changes in UK pensions legislation, the latest being that the UK government is looking to reduce the tax relief relating to pension schemes, by restricting the maximum amount of tax-relieved contributions, as part of plans to reduce the country’s budget deficit. Hence, more and more people are looking to transfer under the QROPS provisions now, to avoid their pension being adversely affected by any further changes in the UK tax rules. We are also living longer and so it has become more important to have flexibility and control over our private retirement savings. A good QROPS will also allow you to vary your income in the future. Overall, people are now more mobile, brought about by our right to live, work and retire in other EU countries. Consequently, our retirement savings need to be able to support our changing lifestyles. Unfortunately, if we depend entirely upon government policy to ensure we have enough income for our longer periods of retirement, we may find our plans to have an adequate level of retirement income are ruined as a result of constantly changing policies. Are QROPS affected by UK pension reforms? For those expats who have already transferred pensions to a QROPS or are thinking of doing so, UK legislation provides for the UK private pension reform to follow through to such schemes, subject to the QROPS complying with specific requirements set down by HMRC. However, a complication exists due to the fact that the separate UK QROPS Regulations do currently not allow people to fully cash in their pension funds if the QROPS is not located in an EU jurisdiction. However, even for QROPS in EU jurisdictions, it then falls to those jurisdictions to make the necessary changes to their own internal pension law. Malta has already taken this step and so its QROPS are able to provide the same flexibility as UK money purchase schemes. In any event, the taxation outcome of someone fully cashing-in their pension fund (whether while still in a UK pension arrangement or from a QROPS) is likely to be a sufficient practical deterrent for anyone actually wanting to do this. So, for someone who has left the UK, a QROPS should continue to be a viable alternative to retaining UK pension benefits, particularly as the advantages of a QROPS have not changed. 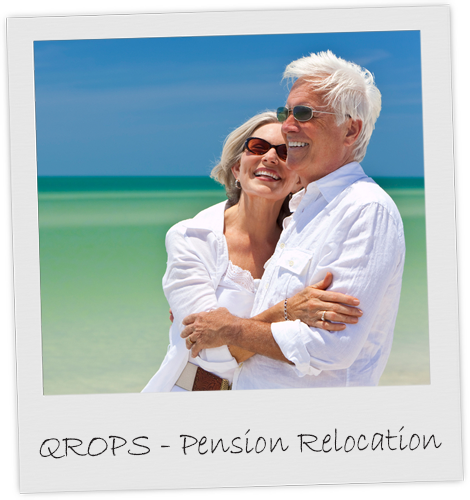 the QROPS is an employer sponsored occupational pension scheme, overseas public service pension scheme or a pension scheme established by an International Organisation (for example, the United Nations, the EU, i.e. not just a multinational company), and the member is an employee of the entity to which the benefits are transferred to its pension scheme. It is also intended that the above provisions will apply to transfers from one QROPS (or former QROPS) to another, if this is within five full tax years from the date of the original transfer of benefits from the UK pension scheme to the first QROPS arrangement. At the time of writing, there has not been time to analyse the draft legislation in detail. Nevertheless, it is clear that taking professional regulated advice is essential. This includes if you have already transferred benefits to a QROPS and you are planning to move to another country of residence.